A mental health professional and former fire fighter ready to help you handle complex tasks and situations. From the workplace, to grief, to bullying, to crisis, Michelle has the tools to share to get anyone through any situation. Michelle is a veteran firefighter, speaker, educator, counselor, and crisis interventionist. In her first career, Michelle worked for 22 years as as a firefighter, paramedic, engineer. 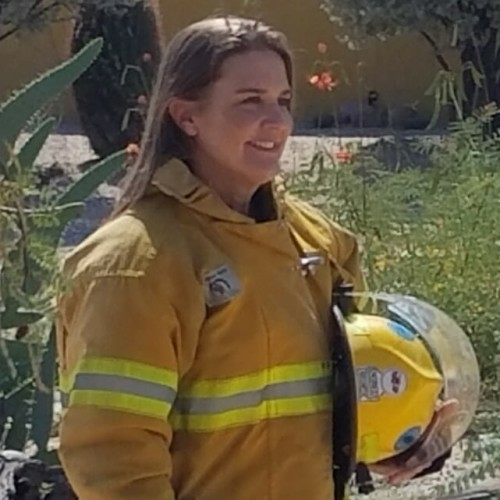 She was one of the first female firefighters and Ladder Truck Engineers in Southern Arizona, and won a 10 year legal battle for equality and reasonable station conditions for female firefighters. For the past decade she has developed a private practice as a nationally certified licensed behavioral counselor. Her counseling specialities are cognitive behavioral therapy, EMDR, PTSD, anxiety, depression, grief, addictions, resilience, and relationship problems. She has a BA in Psychology from the University of Arizona and a Master's of Counseling from the University of Phoenix. Michelle is also a professor of psychology and social sciences at the University of Phoenix and public educator and speaker about mental health issues and available treatments. Her speaking style is inspiring, educational, and filled with good humor and stories from her experiences. She is able to help people from all backgrounds and cultures understand concepts in neurobiology and other important aspects about mental health and coping. Michelle is available to speak on any topic related to her experience or to provide a group seminar on resilience, cognitive function & the brain, workplace and family issues, bullying, grief, emergencies, and other topics. While she loves to help her fellow first responders, she also particularly enjoys introducing her skills and tools from emergency work and counseling to improve everyday life and resilience for everyone. She can help individuals, groups, communities, and families move forward from complex situations, and become even stronger, productive, and happy!